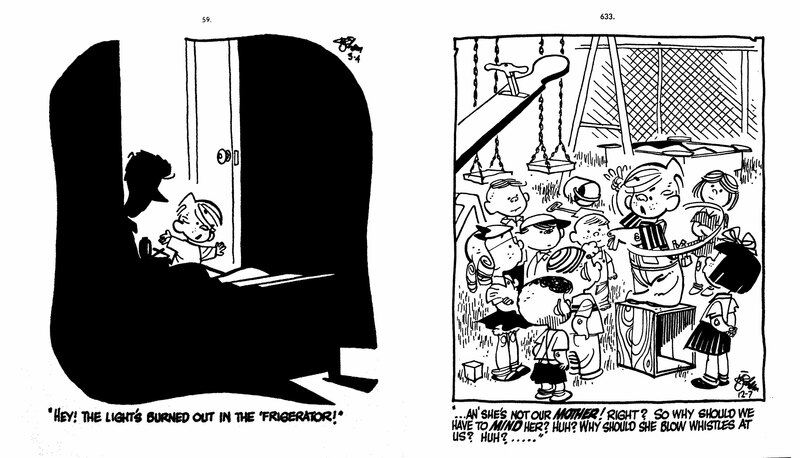 The fifth volume of Hank Ketcham’s Complete Dennis the Menace features all the panels from the ninth and tenth years of the massively popular newspaper feature. By this point, the single panel cartoon was accompanied by a weekly colour Sunday page which featured a standard two or three-tier strip, monthly Dennis comics with much longer stories, various illustrated storybooks, and at the end of 1959, a live-action television show. 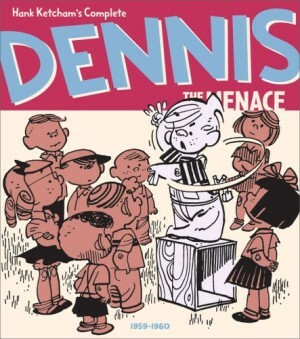 There’s a definite freeing effect on the daily panel, as all the characterisation and longer stories of the other Dennis product meant readers were familiar with the cast of the strip and Ketcham could use that familiarity to good effect to make (relatively) subtler jokes. Some panels are built around sophisticated design and extravagant, clever detail: page 201 sees the Mitchell family in the middle of a grove of tall elegantly rendered trees, preparing for a picnic. The composition takes your eye from Alice Mitchell mid-panel arranging lunch on a blanket, up to the top of the panel where there’s a big wasp’s nest tucked among some black-shaded branches, then down to the open space in the middle of the panel where you suddenly notice Dennis is aiming his slingshot at it. On page 520 the drawing of a supermarket produce stall with an enormous variety of different fruits and vegetables sets up all that detail to deliver the punchline, as the grocer tells a distraught-looking Dennis: “I feel for you pal, but I can’t hide all my turnips just because your mother might buy some!” Ketcham gets to stretch out with some extended sequences where a situation develops over a few days, such as a week of Mr Wilson trying to sell his house (pages 287−292) or ill in bed and unable to escape from Dennis’ visits (pages 450−455). And just when it’s all beginning to feel a little too slick and predictably twee, there’s a complete change of approach. The surreal humour of the panel on page 363 is as surprising and brilliantly funny as any classic New Yorker cartoon. If you only have space in your heart or on your shelves for one Dennis collection, then forget the first three volumes. Four, five and six are the ones to get. 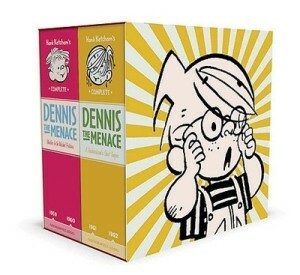 This fifth volume is also available slipcased with volume six, Hank Ketcham’s Complete Dennis the Menace 1961–1962 so if you can find that, you’ll have the bonus of a attractively designed box to keep them in.